We answer readers’ happy-hour questions. This week, we answer a couple of questions from readers. 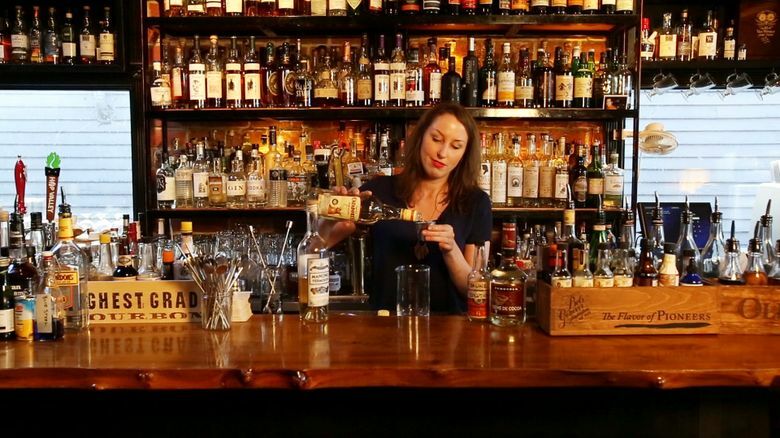 But first, a word about a drink bar hoppers are likely hearing a lot about lately. It’s the “Income Tax Cocktail,” a gin drink from the Savoy Cocktail Book from 1930 that gets dredged up by all the millennial mixologists around this time, the equivalent of eggnog at Christmas. But like income taxes, the Income Tax is awful: 1 oz. gin, ¾ oz. orange juice, ¼ oz. dry vermouth, ¼ oz. sweet vermouth and a dash of Angostura bitters, with the fresh juice clashing with the gin and vermouths. It’s a spin on another “lost classic,” the Bronx, which, by the way, Esquire magazine anointed as one of the worst cocktails to come out during the early 1900s. Q: Where are the good bars for us 40-year-old fogies and up who also like to grab a martini now and then? Opened in 1953, the bar was a place for power brokers, two-martini lunches and a haunt of the late Sen. Warren Magnuson. The Seattle University faculty, nearby doctors and the then-growing Italian-American community in Rainier Valley frequented Vito’s. But it’s not an assisted-living vibe. The Pill Hill workers come early and the hipsters and lifers come late. Heck, Snoop Dogg was once spotted with Dan Aykroyd in a booth there. Vito’s is also one of the best bars for a cheap date, especially on Tuesday night when all wine bottles are half off. There’s free live jazz and R&B. But come Sunday, 6-9 p.m., when the charismatic 95-year-old pianist Ruby Bishop holds court. In downtown, Zig Zag Cafe draws lots of the Gen Xers during happy hour on weekdays. But the hottest place that draws a lot of the 40-and-over crowd is the new bar at Monsoon. It’s blocks away from the nightlife district of Capitol Hill, but there’s a great happy hour early and late, with discounted food (get the Imperial rolls and pork belly), wine and cocktails daily, 3-6 p.m. on weekday and again 9-11 p.m. Sunday-Thursday and 9-11:30 p.m. Friday and Saturday. Q: My boyfriend loves malt liquor. Are there any bars that serve that? A: (Cue the Billy Dee Williams’ Colt 45 commercial.) Hit one of those convenience-store-bar hybrids, which are not as odd as they sound. One of the biggest beer trends in Seattle, owners are tweaking the traditional 7-Eleven-template by adding beer taps behind the cash register and plopping down a bar top next to the aisles of chips and toiletries. Super Deli Mart, 9051 35th Ave. S.W., West Seattle (206-937-1442), and Stogies ’n’ Hops, 526 164th St. S.W., Lynn­wood (425-741-1000 or StogiesnHops.com) both carry malt liquor. Expect more convenience stores to adopt this model.